(Lian Qiao) Important Chinese antibacterial herb used to treat flu and cold. 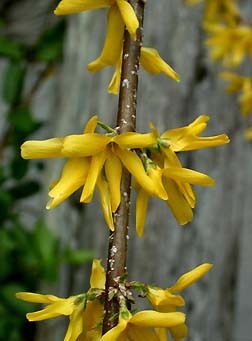 Forsythiaside found in the fruits is effective against a wide spectrum of bacteria and fungi. Also effective against inflammations and helps to reduce fever and boost immunity. Hardy shrub with yellow flowers that appear before the leaves in spring. Ornamental hybrids and cultivars are common throughout North America; however our seed is from authentic Chinese stocks used for the production of herbal medicines. Hardy to zone 5; prefers full sun and shelter from the wind.